Don't know about the AFA, but Jeremy Simmons, the co-owner of the USFA San Jose Spiders, is black. Here's my stance on Atlanta: just move them (with a new name that fits their home location better) to somewhere that the US civil war (which still riles tensions up in Georgia, and did more in the early 1990s than today) had little to no effect on to avoid any possible controversies. Victoty Bowl should be up 12/8, which is either today or tomorrow, depending on where you are. I'm a Big 10 fan, so basically Notre Dame. Actually, a lot of it has just been luck of the draw. This discussion made me go back and look at the data as to how good they've been (which doesn't correlate to performance on a 1:1 basis). In the 70s, during the Sunderland years, they were generally pretty good, always above average and occasionally among the elite teams in the league. That just didn't translate to championships. Their division was fairly tough through most of the period, plus the Miners were at the height of their power at the time (though again, you wouldn't know that by looking at titles). They've never really bounced back from losing Sunderland to the gambling scandal. They really looked like they had some potential in the mid-1980s, but a few of their key players either went down to injury and/or didn't live up to their potential; most notably DE Allen McCarty, who looked like he was on his way to a Hall of Fame before a series of knee injuries in 1986 and 1987 ended his career at the age of 27. That's just been their luck. Strong disagree. I don't know who the Gold Coast Suns are, so it's definitely a coincidence, lol. 2. You're right, it depends on who takes over the team, which at this point would be all speculation. 3. Yes. ESPN games are called by Harvey Whipple (a former Portland Dragons offensive coordinator) and Steven Taylor (the QB who led the Wasps to three titles in the 70s). 4. The 46th, 47th, and 48th Victory Bowls will be played at Veterans Stadium in San Diego, Conoco Stadium in Houston, and the Huey P. Long Dome in New Orleans, respectively. As a resident of Central Indiana, I can assure you that many, if not most, of the people in my state seem to be unaware which side we took in that particular conflict, lol. Either way, relocation is unlikely, and it wouldn't necessarily solve the problem, anyway. If they were to lose their team, ATL would immediately become a top-tier candidate for a new franchise, which would only bring back the debate if they were granted an expansion franchise or brought in an existing one through relocation. As far as the Rebels name goes, how do the people in Atlanta/fans of the team feel about the name? 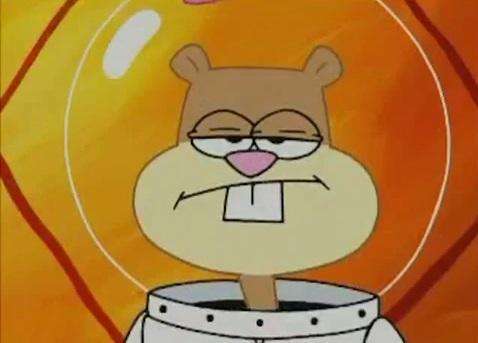 I get the feeling that a lot of fans might be very defensive about the name due to feeling like "another Yankee attack on our culture" but that's my two cents on it. Already a team called the Arizona Firebirds. The game that was hyped as being held in “Sunny Hollywood, Florida,” would see no sun. In fact, thunderstorms early in the day threatened to delay kickoff. Though this would not come to pass, the rain and heavy wind didn’t let up, and both teams had to contend with the elements throughout the night, and the condition of the relatively new turf ensured that the 45th Victory Bowl would go down in history as the Mud Bowl. The weather seemed to slow both usually prolific offenses down. 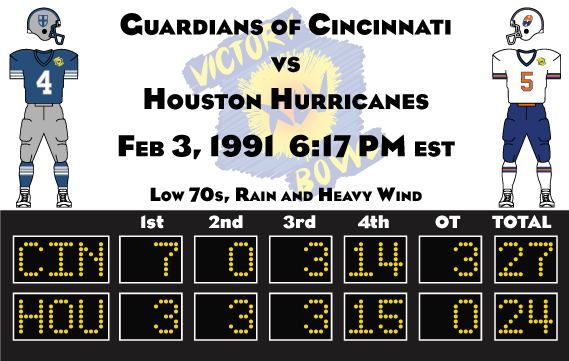 Houston opened the scoring with a 17-yard field goal late in the first, but the Guardians answered with a touchdown in the final minute of the quarter as veteran RB Jim Hill slipped through the line from 2 yards out. The Hurricanes would make it a one-point game 8 minutes later with another field goal by James Pickle, this one from 32 yards out (which was no chip shot, given the conditions). Both teams had excellent opportunities to put up points just before halftime, but both blew it. First, Tom Hudson tried to hit WR James Petrovic on a corner fade in the end zone, but CB Kipp Quarles was able to get a hand on it and bring it in for an interception. Unfortunately for Guardians fans, he then made the astonishingly stupid decision to attempt to return the interception from 9 yards deep in the end zone. He made it to the one yard line before being levelled, forcing Reggie Hart to take the field in the shadow of his own end zone with 51 seconds in the half. After buying himself some room with a 12 yard scramble on first down, the Guardians picked up chunks of yardage over the next few plays. However, as time ran down, Hart took a shot down the sideline in an attempt to move into field goal range. SS Brett Dworakowski picked the ball off and was able to bring it back to the Houston 48 with 12 seconds remaining. Hudson hit WR Ernest Hoskins underneath for a 13 yard gain setting up a potential 56 yard field goal with 4 seconds to play. The kick was no good – though Pickle is as good as any kicker in the league, he couldn’t put the necessary distance on it in the rain. The teams traded field goals after the half, and as the final quarter began, the Guardians clung to a 10-9 lead. With just under 9 minutes to play, however, they seemed to be in good position to seize control of the game as they advanced into the red zone. On third and goal from the 8, Hart took the snap, rolled to his right, and fired a shot to TE Vic Meredith, who fell to the turf before the ball arrived. LB David Rowe made an uncontested catch, and then bolted 104 yards to the end zone, giving the Hurricanes the lead for the first time since the first quarter. Meredith argued that he had been pushed, Rowe claimed that he had just lost his footing in the mud. The discussion got so heated that Cincinnati coach John Thorpe was nearly ejected from the game, but there was no flag. Houston successfully went for 2 as Hudson faked the handoff to Kennedy only to pass the ball to him in the end zone after he ran past the lone Guardian who bit on the play action. Houston’s 17-10 lead wouldn’t last long, as the Cincinnati offense came back onto the field livid over what they believed was a 15-point swing against them on a bad call. It took less than a minute for them to make their way back into the red zone, and then, on the exact same play that resulted in the interception, Hart hit Meredith to tie the game at 17. The tie would hold until shortly before the two minute mark, when Houston made one of the most memorable plays in Victory Bowl history. After a punt resulted in a touchback, Hudson came out and took a shot downfield on a crossing route. He targeted WR James Petrovic, but SS Dirk Hammen came out of nowhere to tip it away – and directly into the hands of WR Mark Ellison. The speedster was in the end zone before the Cincinnati defenders had even realized what happened, and Hurricane fans began celebrating. Surely that play – The Deflection – would be what ended their title drought of nearly four decades. Reggie Hart had other ideas. Once again, he answered a huge play with a big drive, pushing the offense inside the Houston five. The defense stiffened, making an excellent goal line stand, and soon, with less than a minute to play and no timeouts, Hart and the Guardians were faced with a 4th and goal from the 3-yard line. With the season on the line, everyone in the building knew that there were only two possible options for the final playcall – a pass to Meredith, or letting Hart try to score with his legs. Hart took the snap, and rolled to his right, keeping his eyes on his big tight end. Suddenly, he reversed directions, sprinting to his left, Dworakowski, who had been acting as the spy, slipped in the mud as he tried to follow, and Hart was able to dive into the end zone to tie the game at 24. Houston couldn’t score in the final 48 seconds of regulation, and Victory Bowl went to overtime for the first time in 18 years. Given the drama of the second half, overtime was fairly anticlimactic. Cincinnati won the toss, got the ball first, and never gave it up. With each play, Houston’s hopes faded slightly, but the final nail came on third and one from the Hurricane 28. The Guardians lined up in a heavy formation, as if they were going to try to pound their way to the first down, but ran a play action instead. Meredith was able to slip through the thoroughly confused defense, made the catch for the first down, and made it all the way to the 18 yard line before being tripped up. K Chuckie Kleist took the field, drove the 35-yarder through the uprights, and brought the Victory Cup to Cincinnati for the third time in six years. Hey Veras! I’m currently reading through the thread and am at page 44. Could I, by any chance, have an LA Comets sig, specifically one with their 1952 Championship? Thank you. I can't say what's worse, getting btfo'd in your first 2 Victory Bowls or losing a heartbreaker like that? Poor Houston, but Cincinnati is finally living up to being a dynasty. If only Detroit and Cincinnati could meet in a Victory Bowl. Cincinnati wins again! It’s a good time to be a Guardians fan! Can I have an updated sig? Can’t wait for the offseason! Absolutely. Do you want the 1952 logo/colors, the current set, or one that shows the change over time? This one was at least exciting to watch, and it can no longer be said that they've been outscored in every quarter of every Victory Bowl in which they've played. A Detroit-Cincinnati Victory Bowl would be epic, but if it's going to happen, it had better be soon. The Guardians' superstars are approaching the end of their careers, and Detroit is at risk of losing a centerpiece of their offense in RB Johnny Hewitt. He has publicly said that he'll play for the highest bidder, and his contract is up this year. The team will almost certainly protect him from free agency, as they are unable to do so in consecutive seasons, there is a good chance he will walk in 1991. It was a long enough wait, too. Prior to Hart's arrival, the Guardians had usually been among the worst teams in the league since the 1950s. This is extra painful for the Hurricanes coach Roosevelt Brown, who was Cincinnati's offensive coordinator through the 1984 season. Since he left, the Guardians have won three titles, two of which have been at his expense. The veterans who have been in Cincy long enough to have played under Brown all universally love and respect him. During the 47-7 blowout in 1987, they pulled their punches late in the game, and Meredith said after the game, "Coach Brown and all of Houston really deserve a championship. I just wish they could have been here in a year that we weren't, you know?" For what it's worth - the crushing loss in '87 didn't slow them down. They've gone 12-4, 13-3, and 13-3 in the regular season since then. It just hasn't translated to a title. But they're a young team. This could get into their heads. Do you want the 1952 logo/colors, the current set, or one that shows the change over time? I’ll have the Purple and Red for the sig, but make sure you include a championship banner with the ‘52 Logo on it. Also, it would be helpful to know how to put in one of these sigs. I own an IPad. Thanks for accepting!